From the Blue Ridge Mountains to the beaches on the shore, Virginia hikers enjoy many of the most beautiful trails anywhere in the country. Whether you’re in the mood for a casual stroll or training for an arduous hike, there’s something for everyone along the trails. Here are 15 of the best Virginia has to offer. Listed on the National Register of Historic Places for its place as Virginia’s first planned state park, the First Landing State Park offers nine different hiking trails covering over 19 miles in total. 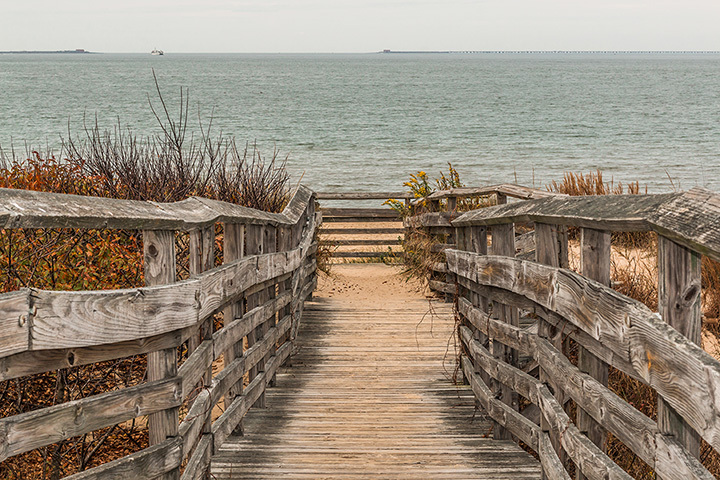 A favorite for Virginia Beach locals, the 19 different trails offer short jaunts, like the third of a mile Fox Run Trail, as well as the Cape Henry Trail (six miles long). A must for anyone near the beach. As a recent visitor said, “This hike is truly one of the hidden gems of the state of Virginia. I've lived in Virginia for 28 years and only until recently did I learn of Crabtree Falls. It's one of the most majestic sights I've ever gotten to see in my life and I was BLOWN away by the views of the different waterfalls.” This moderate difficulty trail offers 1,200 feet of falls—more than anywhere east of the Mississippi River. The year-round Sugarloaf Loop Trail is one of the more lightly trafficked trails on this list, but certainly worth the excursion. Cutting through the beautiful Shenandoah National Park, the Sugarloaf Trail is great for families. Clocking in at just over four miles, the trail offers excellent bird watching, wonderful wild flowers, and walking for all skill levels. Enjoy a day trip to Thomas Jefferson’s Monticello before heading out for a nice, leisurely hike through the Saunders-Monticello Trail. The two-mile trail is covered with greenery and boasts great views of the Monticello Mountains. The trail is walkable, bikeable, and runnable. Make sure to stop by the Secluded Farm for even more natural splendor. If you’re in the mood for a different kind of trail, the newly finished Adventure Park at the Virginia Aquarium offers zip lining and wooden platforms that create an “aerial trail.” Perfect for hikers of all ages, the Adventure Park has 13 different color-coded aerial trails ranging from beginner to expert. Hiking aficionados may find The Adventure Park less of a challenge, but children will love it. Use as an introduction to hiking and to develop an early love for nature. The James-River Branch Trail is just one of Virginia’s 32 Rails to Trails conversion projects, in which abandoned and run-down railroad trails become glorious new hiking and biking trails. Recently featured on PBS’s Virginia Currents television magazine, the 2.5-mile James River Branch Trail is a quiet respite from bustling Richmond city life. Another Rails to Trails success story, this 34-mile trail through the Blue Ridge mountains is a state-wide favorite. While seemingly daunting at first, their website shows a six-year-old making his way through the trail without too much trouble. Make sure to stop by the scenic Laurel Creek near Mile Marker 20 for great pictures. One of Virginia’s most popular hiking destinations, the Old Rag Mountain is for the more experienced hikers amongst us. Newbies beware: Old Rag is famous not only for its rigor, but for its danger. Search and rescue missions are common, so make sure to follow the safety guidelines and plan accordingly. But for those that prepare, the views from Old Rag Mountain are worth the extra preparedness. Excited by danger? Not afraid of heights? Then Hawksbill Mountain in the Shenandoah National Park is for you. At 4,050 feet, Hawksbill has the highest peak in the park. Choose between the 1.7-mile steep trail or the 2.9-mile moderate approach. But remember: This trail isn’t for the faint of heart! For those that prefer nature’s wonder to steep trails, the Great Falls National park might be more your speed. The big attraction here is, you guessed it, the Great Fall. With 15 miles of hiking trails and many to choose from, make sure to plan which sights you’re most interested in. The River Trail, a 1.5-mile one-way hike along the Potomac River, offers perhaps the best views of Mather Gorge. McAfee Knob is known as the most photographed site along the Appalachian Trail. From the website: “On a clear day you will have some of the best views in the Southern Shenandoah Valley. Due to its popularity you will not be alone on this hike, but the overhang of McAfee Knob and its views make up for the lack of solitude.” The climb is just over four miles and mostly straight up, but well worth the ascent. There’s no better way to view the historic High Bridge, spanning more than 2400 feet long and 160 feet above the Appomattox River. Gaze below and remember one of the last Civil War battles that took place just underneath. This pet and family friendly trail is perfect for a day trip that mixes the outdoors with history. Located on the Virginia/Kentucky border, the Breaks Interstate Parks shares its interstate designation with only one other park in the nation. With over 4,500 acres of scenery, this versatile trail can be as difficult or relaxed as one wants. Make sure to stop by the “Grand Canyon of the South,” a 1,000-foot gorge on the property. Named for the monolithic rock jutting up from the ground, the Dragon’s Tooth is one of the most popular destinations for Virginia hikers. The Dragon’s Tooth Trail starts out relatively easy, but just under a mile in becomes one of the steepest in the Appalachian Trail. But once you’ve braved the treacherous path, the natural beauty of the 3,000-foot high Tooth can only be described as magical. The Channels Trail is quickly gaining in popularity, but many casual hikers aren’t yet aware of this 400-million-year-old gem. The actual hike is quite easy, but the main attraction is the “slot canyons:” naturally formed passageways and crevices carved into rock and stone. The maze is quite twisty-turny, so make sure to pay attention to where you got in and out. Few other locations in Virginia offer the same kind of experience. View more Virginia Hiking Trails.